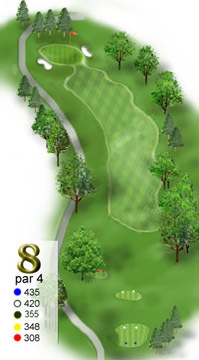 Hole 8 is a long par 4. A shot off to the right could cause a lot of trouble because of the trees. If you do have a shot from here the green side bunker to the right front will come into play and the green is difficult to hold. The best shot is left side fairway.